Three families, whose lives are inextricably linked by the street they inhabit, grapple with love and morality amid political upheaval. 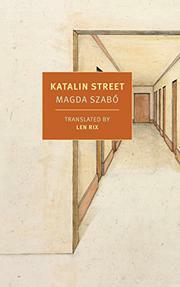 In English for the first time and impeccably translated by Rix (The Door, 2015), Szabó’s quietly captivating novel excavates the tangled history of Hungary’s capital from the portentous moments before the German occupation to its suffocating postwar regime. In 1934, enveloped by a garden “teeming with roses,” we meet Irén and Blanka Elekes, Bálint Biró, and Henriette Held, the beloved children of three neighboring families who live on the titular Katalin Street. The four of them are inseparable, like cousins, apart from the fact that each of the girls, at one time or another, has loved Bálint, the major’s son. “Bálint was the sort of person who inspired that response from others without in the least intending to,” Irén observes. “You simply had to love him.” In Irén’s case, her unuttered desires are requited when she and Bálint are engaged a decade later. As soon as their celebration begins, though, it’s disrupted by a phone call and eclipsed by the reality of war; Henriette’s Jewish parents have been caught and deported and their home swiftly commandeered by authorities. But it’s the tragic death of 16-year-old Henriette, who's been hidden by the major and the Elekes family, that ultimately tears these families apart. By the time they’re eventually married, Bálint, who adored Henriette like his own sister, and Irén, who both loved and loathed the girl, are strangers, having long ago buried the happiness they once knew. Beset by a deep malaise from the aftershock of war, the Elekes family, forced from their home and dispossessed in every sense, live as ghosts, the past forever looping in their consciousnesses, “locked in the same hopeless quest to recover [Katalin Street].” And Henriette, a spectral presence hovering throughout the novel, acts as an onlooker, bearing witness to the emotional decay brought on by the relentless forces of age and memory. A visceral, sweeping depiction of life in the shuddering wake of wartime.